Whenever I hear Nina’s earthy, electrifying voice, I think of my older sister, Carolyn June. They shared the same fiery passion for justice and equality; both of them made people feel on a deep level, whether they wanted to or not. Her passing split my world wide open with grief and marked the beginning of the end for many things in my life. The shock and grief of her passing is forever bound with the disintegration of my family of origin and the loss of my own daughter to adoption three and a half years later. So today, in honor of my big sister’s would-have-been birthday, I will cue up my Nina Simone playlist, crank it up as loud as possible, and dance and sway with abandon as I celebrate my sister’s short sojourn here on earth. Posted in Uncategorized	| Tagged birthday	| Enter your password to view comments. The Professor was supposed to go to summer camp this morning. I didn’t take him and he was happy to stay home (he is quite the homebody, kind of like his dad). I just can’t have him away from me today. This is atypical behavior for me, but today…today I will honor the need to keep him close to me. Right now he is in the entertainment room watching “Phineas and Ferb.” Poppy is happily placing Mickey Mouse stickers around my office. I imagine Captain Knuckle is still in bed, but I don’t know for certain, as he is in Utah with his dad. Me? I am sitting here, trying to hold it together, fighting against the urge to pull the shades tight, crawl back into bed and bury my head under the pillows for the rest of the day. If I can just make it through today, I can wake up tomorrow and somehow manage for another year. [6/18/12 9:00:41 AM] JR: Hello gorgeous! [6/18/12 9:00:45 AM] Me: Today is Ms. Feverfew’s birthday. [6/18/12 9:01:25 AM] JR: sad day for you? [6/18/12 9:01:27 AM] Me: Trying really hard not to spend it all in bed. Good thing I have these other kids to take care of, otherwise, I would. [6/18/12 9:01:43 AM] Me: I don’t know if sad is the right word. [6/18/12 9:01:45 AM] Me: Or the only word. [6/18/12 9:01:51 AM] Me: I mean, I am glad she was born. [6/18/12 9:01:57 AM] JR: of course. [6/18/12 9:01:59 AM] Me: It’s just hard to be spending another birthday without her. [6/18/12 9:02:06 AM] JR: yeah, I know what you mean. [6/18/12 9:02:13 AM] Me: And realizing I will most likely never get to spend one with her. [6/18/12 9:02:24 AM] Me: And accepting the fact I can never get back the ones I have missed. [6/18/12 9:02:31 AM] Me: Adoption, the gift that keeps giving. [6/18/12 9:03:03 AM] JR: Adoption, the gift that you keep on giving. In just two and a half minutes, we summed up what has ailed me for nearly the last two decades. Added on top of all of the birthday sadness is the realization that the TRUTH about how adoption would affect you and me was purposefully withheld from me when I was trying to make a decision about this…it’s hard to admit I was taken advantage of (not by your parents, THANKFULLY, but by church leaders and the adoption industry). It’s hard to admit I was duped. That I was coerced. That I could not have given informed consent because…well, because I wasn’t informed. It would be so easy to spend the day crying. So very, very, VERY easy, but I am going to choose faith today, as much as possible. So today, I chose to believe God is bigger than all of this. Today, I choose to believe God’s power to heal is more powerful and permanent than the lies I was told. Today, I chose that perfect brightness of hope, a hope which shines through even the deepest darkness. Because things are pretty dark right now. For you, a birthday treat from your little brother and me. 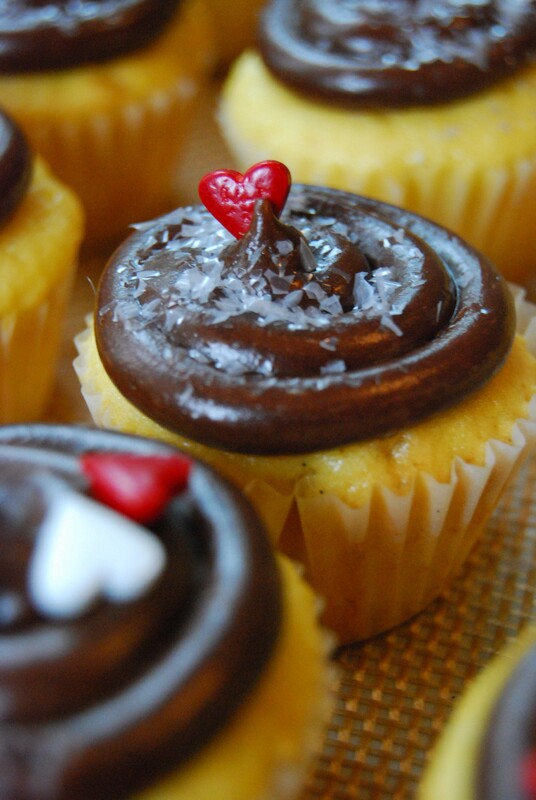 A tiny vanilla bean butter cupcake with chocolate fudge frosting. Does He Do This on Purpose? For the past couple of years, my ex-husband has scheduled Captain Knuckle’s summertime visitation to begin on…(drumroll please)…your birthday. So for the past three or four years, I get to “celebrate” your birthday by putting my oldest son on a plane. He then jets across the country to spend several months with people that hate me and honestly wish I would just die so they could have him without any interference from me. Whether scheduling his flight to coincide with your birthday (again) was intentional or not, it still feels like twisting the knife even more and shoving it in a bit deeper. P.S. So I am wondering if you want me to send you a birthday message on Facebook or not? And when do I send it? Before your birthday, on your birthday, after your birthday? Not at all? Ugh. Where is the stupid manual on how to manage a non-reunion with the child you gave away because you didn’t think you were a good enough person even though in reality you were (still are) an amazing mother?